3 Skin instruments in ascending pitch. Bowl – if a sufficiently large bowl is used it may be appropriate to strike it using a modified bass drum pedal. Any large and sustaining instrument (such as a gong) can be substituted. 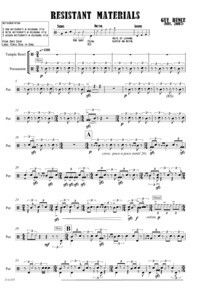 The piece explores the contrasting timbres of the three materials, first setting them off against one another and then gradually bringing their sound worlds together. Each timbre is given motifs which later merge. Most of the motifs are based on number patterns such as prime, fibonacci, square, & cubed numbers. The striking of the temple bowl marks section changes and important beats in relation to the number patterns.